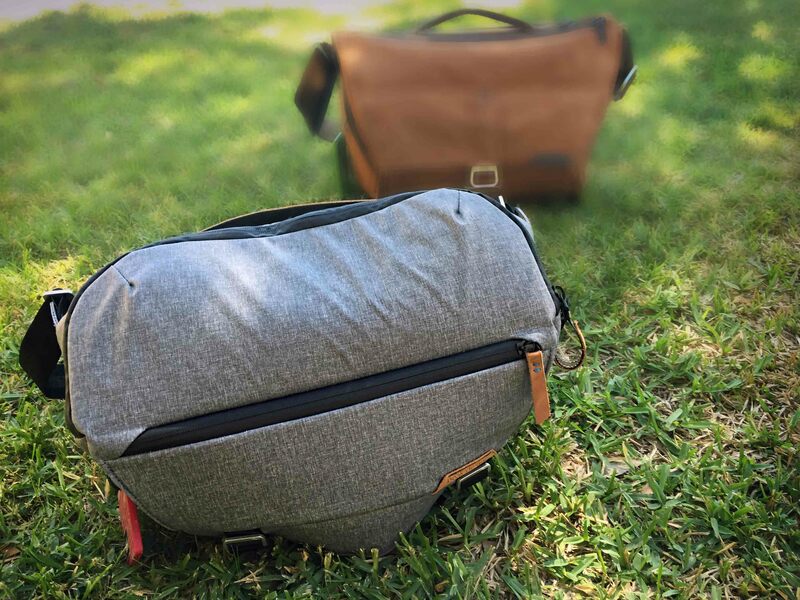 Everyday Sling (L) and Everyday Messenger (R). The Everyday Sling would arrive in mid-September and I was thrilled someone thought enough of me to offer this bag up. However, I didn’t think about it much, nor did I know the specifics regarding the Sling other than it was smaller than the EDM. Remember, I loved my current bag (and still do). What I did ponder was this; what if the Sling didn’t live up to the hype? Would I be willing to write a negative review about product I wanted to like from a company I truly LOVE?? I was comforted by the fact I didn’t know of one Peak Design product that was bad, why would the Sling be any different? When the Sling did arrive, to my surprise it seemed as if the beloved EDM just had a little brother! The build quality along with everything else I saw on the outside of the Sling immediately screamed Peak Design. It is literally like a mini-EDM where they cut out much of the extra storage space and came up with a versatile Sling bag. I intended the Sling to be for traveling light, a body with a lens attached and maybe another lens or two in the bag. However, while the Sling is smaller this is not to say the it isn’t without its features. While there is no perfect bag, Peak Design’s EDM was the first bag that I didn’t feel like I was just settling in some way. With the Sling, I again found what I need and feel! Dividers move where you need and fold down to store gear on top. The split top folding dividers make customizing the Sling very easy! on the fold-over portion allowing you use them like the EDM’s, or as individual storage above each lens compartment by leaving one part folded down and one up (left). The cool thing is that if you like the inserts of the EDM, these function exactly the same. If you need them to function differently in the future, it’s built in! These might seem like little things, but in a compact bag like the Sling, these small features add up and make the Sling stand out. The similarities with the EDM are evident in other ways. The water resistant materials, quality stitching, a clean design with no unwanted straps hanging, space for an iPad or similar device, covered zippers, and built in tripod stowage are all items I have now come to expect from Peak Design; and they delivered! The Sling (L) and EDM (R) are both able to use the Peak Design Capture to store your camera externally. There is a pocket on the inside cover that provides easy access to items regularly needed. In fact, all pockets can be accessed without taking the Sling off and any raising or lowering of the bag is mindlessly simple. You’ll never fumble for gear or dump stuff in the street (yes, I’ve done that with a backpack). The shoulder strap is made to easily adjust when you want to get in the bag, so if you like carrying it high on your back it’s not a big deal. There is also a strap in the main compartment to attach your keys and even a reinforced area to hang a Peak Design Capture! Like I said, this is a compact and purposeful bag so all these numerous little features amount to a big deal! My love affair with Peak Design products began about 4+ years ago when I was tired of taking the wrist cuff off the camera so I could put it on a tripod. After a little searching online, I found a Peak Design product that made exactly what I wanted except it allowed the camera to be mounted to a backpack or belt! Since then I’ve used much of their gear because it’s built to last and works as advertised. It is so refreshing to see a company like Peak Design who stand behind their products and haven’t forgotten where they came from! The Sling is no different and a prime example of Peak Design’s dedication to making quality photography products. They never stop amazing me with their ingenious products and I actually get excited when they advertise a new product release! Lastly, two final thoughts about why I have loved Peak Designs products, this Sling fits in to both categories. First, once you use their gear you’ll wonder why you didn’t check them out earlier. I wasn’t even wanting another bag, now I’m hooked on the Sling. Second, all Peak Design products are built tough and whatever you buy, you won’t be replacing it anytime soon. So, if you’re on the fence about the Sling, don’t be as it’s built to last, will safely carry your gear, and very comfortable to carry. Thank you Peak Design and Purple Orange for this great opportunity! Next Post: Mount Rushmore, lessons learned.